Periodontology is a field of dental care that focuses on the bone and soft tissues (or the periodontium) of the mouth, which support the teeth and their position in the jaw. From this word is also derived the term for gum disease: periodontitis, which denotes inflammation of the gums and deeper periodontal structures. Periodontitis is the most common chronic inflammatory disorder in humankind, which is, at the same time, treated less. Among those over 35 years of age, 8 out of 10 people suffer from chronic gum problems. The focus of the Periodent clinic is interdisciplinary and productive periodontology. Our practice has shown that every person over 35 years of age should visit a periodontist on a regular basis. change in the position of teeth in the jaw. An inflammation of the gums that has redness, swelling, and causes bleeding during the brushing of the teeth is a response of the organism to specific bacteria that accumulate on the teeth. If you experience one or more of the above problems regularly, then the periodontist can help you. If you suspect a problem with your gums, but need further information, please contact us. Why choose periodontology from Periodent? 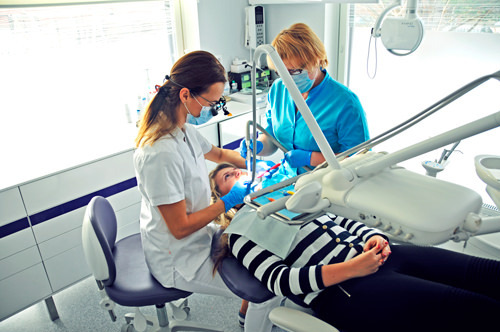 Interdisciplinary approach – the clinic includes specialists in different fields of gum and dental care, whose help can also be included on an ongoing basis. Comprehensive consultation – we prepare a plan of personalised care based on the specific needs of the patient. Detailed care – we monitor every tooth, make a prognosis of the treatment and possible risks. Results – practice has shown that our collaboration with patients in the name of gum health works! We offer diverse treatment options for gum problems.